Recorded live at the Paradise Garage, King Street, New York in 1979 by Larry Levan. In the booklet, the artist name for track 2-7 is "John Gibbs & The U.S. Steel Band"
The packaging of this edition is a slipcase where the white parts glow in the dark, and it holds 2 individual digipak sleeves and a booklet. A subsequent edition was issued in jewel case. When this first came out, I didn't really get it, being more into the eclectic Loft sound. 11 years on from the release, this Levan mix just gets better and better and is played all the time, especially in the car where I can turn it right up. To some modern ears I guess the mixes sound ropey, there are some key clashes, but to me the sound if full on, proper songs for the most part, dripping with emotion. Can't beat it! Beautifully packaged, great booklet and liner notes, and only cost 9 bucks brand new. Pick good records and Play them. Enjoy yourself, and help the crowd do the same. This is one of the most imperfect live mix CDs available, and would simply not obtain a release if it was recorded by a current DJ. But this was recorded in much more primitive times, when DJ technology wasn't as developed, underground clubs were not all about perfect mixing and 8 hours of identical, formulaic music. On this CD, you can hear manual adjustments to record speeds, trainwreck mixing and even some ill-advised mix selections, as well as analogue sound quality. Why then, is this CD apparently so great? Because you can really feel the passion the DJ has for the music, and the quality of the music is so high that the recording's technical imperfections don't detract from the experience. Just imagine that you are there. 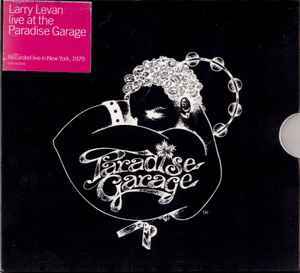 Imagine that your first rave in 1988 was really a visit to the Paradise Garage in 1970s, and just imagine how you would have felt. Would you have been listening out for technically-perfect DJing, or would you have been having the time of your life, at the start of something significant? Since buying this, I have listened to this dozens of times, and it still sounds amazing. Buy this and listen to history being made. It really is that good. Excellent historical document - this was just a regular night at the Paradise Garage recorded on tape , while the action was on . You can hear that it's from a tape , because track 11- People's Choice- "Here We Go Again" .. is split into 2 parts , something that happened a lot when the 45 minutes of a cassette's running-time was over , before the song was finished . This is 80 minutes of pure Paradise Garage spirit caught in the act .. He used 2 Thorens turntables without pitch control and a very primitive mixer ,so all of the turnovers are made manually . The only extravaganza you hear here are parts of the intro to an old Grand Funk Railroad track layed over the last song "ERUCU'" by Jermaine Jackson.. children's voices saying - " obey your mother and your father , do what the teacher says and everything will be allright . ".another kid says : "I believe there are more people that are bad , than there (are) good ; when you're good you'll live forever , when you're bad you'll die when you die.."
When first purchasing Larry live at the garage my first thoughts were how good it must have been to hear his set in 1978, and why don't they make records as classy as that anymore. Attention, at this moment you hear music history. The mix isn't that what most of us understand as a technically perfect DJ-set, but I can imagin that THIS was an absolutely INSANITY at this time! Listen and feel the avantgarde in it. Yes.